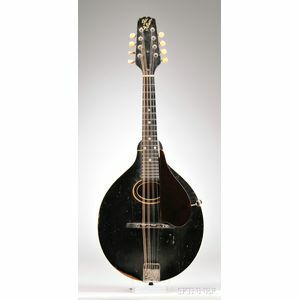 American Mandolin, Gibson Mandolin-Guitar Company, Kalamazoo, c. 1924, Style A, labeled GIBSON MANDOLIN STYLE A, NUMBER 77949..., length of body 13 3/4 in., with original case. Repaired hairline face crack, missing tailpiece cover. Surface scratches, abrasion to finish at lower bout edge of top.